On the twelfth day of the championship at Sandro Cabassi stadium in Carpi, Parma Calcio 1913 played to a 0-0 draw against Virtus Castelfranco (box score below). It was a hard-fought game in which every decision from the referee was influential towards the final result. In particular, a missing yellow card for Filippo Laricella, the opponent that knocked down Christian Longobardi, forcing him to leave the field after only eighteen minutes of play and nullified the regular lineup just before the break to Matteo Guazzo, who substituted for him. The strong defense of the home team and the referee’s decisions got under the skin of the Crociati, who by the end of the match had two players sent off: Guazzo by way of a straight red, and for Mousa Balla Sowe by way of a second yellow card. In spite of all of this, however, our team, even only numbering nine, continued to fight for a goal until the end, though they unfortunately were not able to put one into the net. 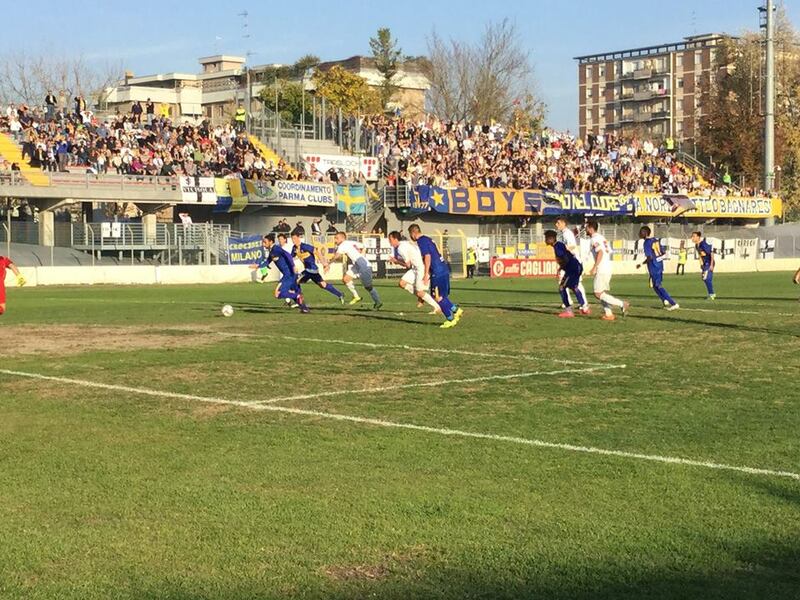 With this result, Parma Calcio 1913 continues their series of positive results and maintains their undefeated record, keeping their place at the top of the table for Girone D of Serie D.
VIRTUS CASTELFRANCO: Gibertini, Benedetti, Laruccia, Negri, Girelli (Cap. ), Biagini (V.Cap. )(41’st A.Vinci), Oubakent, Martina (47’st Signorino), Rolfini, Lauricella (35’st G.Vinci), Cortesi. Manager: Chezzi. Available: Cordisco, Budriesi, Graziosi, Serafini, Cortese, Battistini. PARMA CALCIO 1913: Zommers, Adorni, Agrifogli, Corapi, Cacioli (V.Cap. ), Lucarelli (Cap. ), Musetti (22’st Melandri), Giorgino, Longobardi (18’pt Guazzo), Baraye (10’st Lauria), Sowe. Manager: Apolloni. Bench: Fall, Benassi, Saporetti, Rodriguez, Sereni, Vignali. Referee: Sig. Riccardo Turchet di Pordenone. Assistants: Sigg. Alberto Zampesa e Andrea Torresan di Bassano del Grappa. Yellow Cards: Martina (9’pt), Cacioli (11’pt), Adorni (31’pt), Lauricella (39’st), Girelli (3’st), Baraye (6’st), Sowe (10’st), Negri (15’st). Red Cards: Guazzo (41’st), Sowe for double yellow (47’st). Recupero: 3’pt, 4’st. Nullified goal by Guazzo (43’pt).